2X NEW 4 ohm 40w FULL RANGE LOUDSPEAKER THAT IS ONLY 49MM IN DEPTH, SO IDEAL FOR A CONSOLE FITMENT, PARTICULARLY ETYPE AND ASTON DB.. 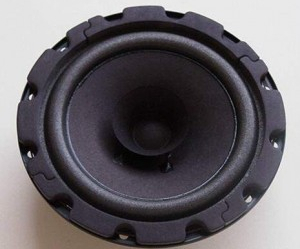 THIS UNIVERSAL FULL RANGE SPEAKER HAS A BULIT IN TWEETER CONE AND IS PERFECT FOR CARS FROM THE 50's, 60S TO 70S. IDEAL WITH OUR CHROME LOUDSPEAKER GRILL 5" 13CM. ALSO FITS THE CUTOUTS FOR MERCECDES-BENZ 300SL, SLR and 300A, 300B, 300C, 300D, 300S, 300SC and as a rear loudspeaker for MB 116 and 123.